I saw a lot of Sophie's kicking about at baby groups and at first I wasn't very sure what they were! A quick google later and I had my answer. 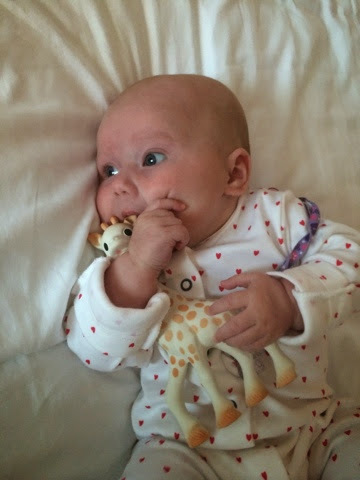 Sophie is a very clever little giraffe teething toy! We got ours for £9.99 from Precious Little One because we were getting our iCandy sunshade from there anyway and it was a lower RRP than some other retailers. • Natural Rubber is soft, safe & non-toxic for baby to teethe & chew. • Lightweight & easy to grasp for tiny hands. • Painted with non-toxic, food-grade paints. • Stimulating to baby’s senses with her soft colours & gentle squeak. • Bumpy head helps soothe sore, teething gums. • Sophie makes an amusing squeak when squeezed - such fun for a baby! • Slender, flexible & soft - babies love manipulating & teething Sophie. 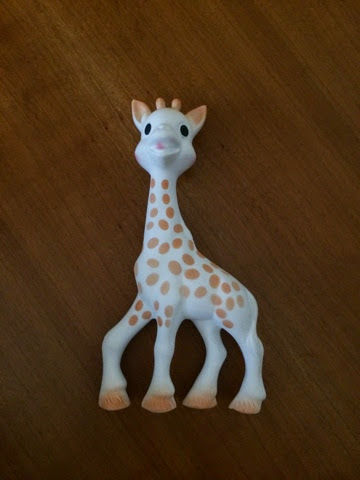 • Sophie the Giraffe is Phthalate-Free with No Vinyl (no-PVC)! • Born in France in 1961, Sophie the Giraffe is a classic! What really interested me about Sophie is that she's also a stimulating, sensory toy as well as a teething aid. Even at 3 months a baby's eyesight is still limited and they can only make out contrasting colours. The dark spots all over Sophie the Giraffe’s body provide visual stimulation and baby soon recognises her as a familiar and reassuring object. Sophie has a squeaker which can keep baby (and dogs it would appear!) amused, stimulates baby's hearing and also helps the development of baby recognising the link between doing something and it's effect. Sophie the Giraffe is completely safe and to chew due to being made from 100% natural materials. Her soft texture and chewable parts make her fab for soothing baby's sore gums when teething. Like mummy's skin, Sophie the Giraffe warms to the touch, which is stimulating and soothing which provokes physiological and emotional responses that soothe baby. The scent of natural rubber, from the Hevea tree, makes Sophie easy for baby to recognise amongst all their other toys. In addition to the 5 sensory attributes above, Sophie the Giraffe's shape and size make her the perfect fit for small hands. She is super light and her long legs and neck are easy for baby to grip, even from birth. We've had our Sophie a few weeks now and Isla loves her. She grabs her, sits and stares at her and loves to have a good old chew with her little gums. She is starting to show signs of teething and it looks like Sophie is going to be a great help throughout the next few months. We looked at other teething aids but none of them were made from as natural materials as Sophie is. And none of them doubled up as a fun toy as well. So for now, we're just using her! I can definitely see why these toys are such a hit with parents all over the world. What teething aids do you all use for your little ones? I bought my youngest one and she liked it for a bit, but I gave it away as I had a clearout and I regret it now! Oh noooo! Always what happens isn't it! The dark and contrasting spots all over Sophie the Giraffe's body provide visual stimulation and make her easily recognizable to baby. She soon becomes a familiar and reassuring object.I bought bottle brush cleaning sets, this was awesome!